A Mini-Series is a small subset of lessons from a major series which covers a particular subject or book. The class numbers will be in reference to the major series rather than the mini-series. Scripture references on this site can be viewed by hovering your mouse cursor over the reference to see a pop-up window with the verse displayed. If you wish to use a different version of the Bible, you can make that selection below. If you have Logos Bible Study Software installed, you can check Libronix to bring the scripture reference up in Logos. The epistle to the Colossians is a book that focuses on the sufficiency of Jesus Christ and the significance of that for our spiritual life: for the way we think and the way we live. The author of this epistle is the apostle Paul. There was heresy going on in Colossee, which was a blend of different ideas. We run into the same kind of thing today. There is all manner of blends of religions today. People think they can pick a little bit of this and a little bit of that, mix it together and add a sprinkling of something else and come up with something they think works for them, and make some new religion. Religion isn’t something that you can believe in because it just “works for you,” it has to be something that has objective reality and objective truth, and is internally coherent and consistent. Yet most of what most people believe is nothing more than a bunch of irrational bilge that somehow makes them feel good rather than deal with what the Word of God says about their basic condition as a sinner. People don’t like to recognize they are a sinner and in disobedience to God because in arrogance they are rejecting the truth. 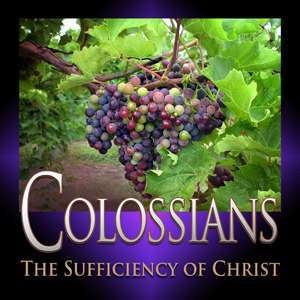 So with this Colossian heresy, we see the focus is on the sufficiency of Christ. It is that which helps us to realize that no matter what the issues are that we face today, the solution is still the same. It is still the sufficiency of Christ. There are three areas of sufficiency that are always attacked by false teaching and by Satan: the sufficiency of Christ, the sufficiency of grace, and the sufficiency of God’s Word. If God’s Word, God’s grace, and Jesus Christ aren’t enough, then where are we going to get help? We going to go to psychology, to science, sociology, or to some other area of human thought and thus we are going to dilute and diminish the power of God, and we end up destroying grace, destroying Scripture, and destroying the reality of who Jesus Christ is. This is the reason Paul is writing. Video DVDs of these lessons can be ordered here and here. To view all video Bible studies in the Colossians series, click here. To listen to this series as a podcast, copy and paste the following URL into your podcast software. How do we find God's will? Does God always have a specific will for each detail of our life, or, for the issues that don't involve morality or biblical commands? Or is the test of decision making more often related to the process of how we make the decision, than the specific decision itself? In this lesson Pastor Dean continues to answer these and other questions related to knowing God's will and making wise decisions. We come to know the will of God through the accumulated wisdom of His Word. God no longer gives special revelation and examples of our set of circumstances may not be in Scripture. Learn the different categories of God’s will with illustrations from Scripture. Peace in this verse is the vertical peace of reconciliation which brings the horizontal peace within the Body of Christ. The real question in every life is, “How can I best serve God with my life?” With that focus, prayer and trust, the will of God is no longer a guessing game. The purpose of singing hymns is to teach and admonish one another. Does that answer give us a hint as to what kinds of hymns we sing with regard to the words and the music? Will a repeated chorus of “Do Lord” teach and admonish through the potency of the written Word which is alive and powerful? What are some practical ways for us to make certain the Word of God is in our minds and our memories? If the reason we sing is to express our joy and response to God, is singing an option in worship? Is singing a significant part of our spiritual life? God commands corporate worship. It is valuable as an encouragement, a response to what God has done and a display of our joy. At the beginning of the 18th century Isaac Watts added a dimension to congregational singing. How was that change different than the changes brought about by contemporary church music today? Christians knew that all beauty existed in the mind of God and that to know beauty, we first had to know God. The Enlightenment shifted the idea of beauty to an internal, relative standard separate from the absolute standards of God. Beauty was in the eye of the beholder. Which idea reflects joy in worship which is all about God? Anything other than God’s idea of worship by means of Spirit and Truth is a breakdown of standards. Within God’s creation, if all areas aren’t addressed by His righteousness and holiness, then no area is addressed. That must mean that God’s character is the issue when we worship through congregational music. What source do we use to evaluate music for worship so that it reflects intrinsic, objective, Godly beauty? Is our appreciation of beauty a measure of its worth? Learn some fallacies and truths in the worship wars involving church music in our culture. Congregational singing expresses our submission to God’s will and authority. Congregational music is a reflection of Christian culture, not an expression of society’s culture, tradition or a warm up to Sunday’s message. Culture is made up of all aspects of thinking and acting but apart from a Biblical base, it is all worldliness. To evaluate music we must embrace, separate and eliminate. The issue is embracing a standard before we can even consider our music. To embrace our music preference first is to apply an internal, subjective standard and sometimes results in leaning into the attraction of our sin nature. Learn about the source and mandates we embrace and why music is not a neutral element of worship. The foundation of a good marriage is orientation to authority, humility, submission and imitation of Christ and relationships within the Godhead. These are applications that extend to all relationships at every age and marital status. Preservation of this divine institution is essential for our culture to survive and for sanctification to live itself out in our lives. Marriage is defined in scripture, not by starry-eyed lovers or embittered divorcees. Marriage is to fulfill the purpose of God. The only way to know that purpose is to seek advice from scripture. Biblical roles for men and women create clarity. Our culture has attacked these roles creating gender confusion and cultural degeneration. Be encouraged about what the Bible teaches about marriage. Live out His truth in our confused culture and know abundance in a God-defined counter culture.